Seth McFarlane brought the humor, Pharrell Williams the glam, and this year’s winners of the Breakthrough Prize brought the wonder of science. At a glitzy awards ceremony broadcast live from Silicon Valley Sunday night on the National Geographic Channel, the winners were singled out for their achievements in fields ranging from mathematics, to fundamental physics and life sciences. “By challenging conventional thinking and expanding knowledge over the long term, scientists can solve the biggest problems of our time,” said Facebook’s Mark Zuckerberg, who with his wife Priscilla Chan helped establish the prize along with Google’s Sergey Brin, Jack Ma, of Alibaba, Internet entrepreneur Yuri Milner, and 23andMe’s very own Anne Wojcicki. “The Breakthrough Prize honors achievements in science and math so we can encourage more pioneering research and celebrate scientists as the heroes they truly are,” Zuckerberg said. Now in its third year, the prize turns the table on celebrity culture by having stars hand out awards to the luminaries who have made outstanding contributions to math and science. This year’s awards were no different with Academy Award winners Russell Crowe and Hillary Swank, as well as pop singer Christina Aguilera, among those handing out the trophies. “Tonight we put the spotlight where it belongs,” said Aguilera. 23andMe’s CEO and co-founder Anne Wojcicki. 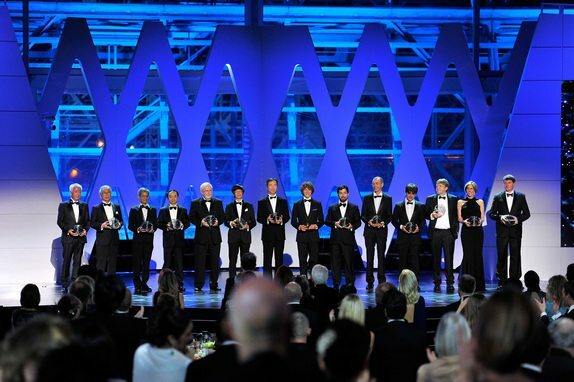 Photo courtesy of The Breakthrough Prize. Photo credit: Getty Images. This year’s prizes included awards to the five teams of more than one thousand scientists from around the world that have made new discoveries around the oscillation of neutrinos, one of the fundamental particles of the universe; as well as an award to mathematicians who’ve solved the long standing problems of symplectic geometry, Riemannian geometry and differential geometry. But for us here at 23andMe, we were particularly interested in the awards handed out for work in the life sciences. Among the winners were Svante Paabo, of the Max Planck Institute for Evolutionary Anthropology, who pioneered the sequencing of ancient DNA. His work sequencing the Neanderthal DNA has helped change our fundamental understanding of human evolution. Also recognized for his achievement was John Hardy, of University College London, for discovering the variants in the Amyloid Precursor Protein (APP) gene that causes early onset Alzheimer’s disease. The discovery has helped give us greater insight into how the accumulation of APP-derived beta-amyloid peptide leads to Alzheimer’s and will help map out ways to better treat the disease. And finally, also particularly inspiring for the researchers at 23andMe is the work of awardee Helen Hobbs, of the University of Texas Southwestern Medical Center and Howard Hughes Medical Institute. Dr. Hobbs was singled out for her discovery of human genetic variants in the gene PCSK9 that trigger the clearance of cholesterol and other lipids and protect against heart disease. The discovery of this protective variant has led to the development of two new drugs that are saving people’s lives. In all a combined $21.9 million was awarded to the winners. To find out more or to see the full list of winners go here.